Anti-Muslim conspiracy theorist Frank Gaffney has received more media attention than usual this week after Donald Trump cited Gaffney's Islamophobic policy organization, the Center for Security Policy (CSP), in his call to ban Muslims from entering the United States. Gaffney subsequently organized a press briefing to elaborate on his conspiratorial claims that Muslims are quietly subverting government institutions through immigration as part of what he calls "civilization jihad." Gaffney then introduced Center for Immigration Studies (CIS) Executive Director Mark Krikorian. 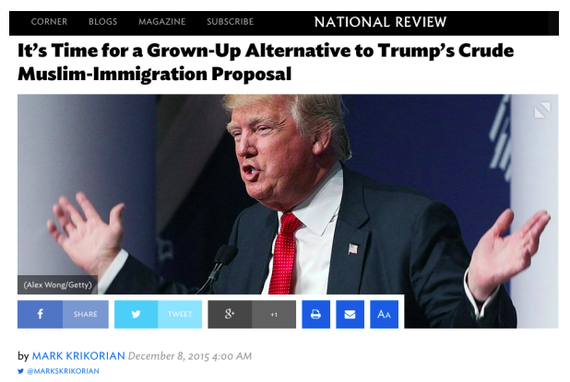 Earlier this week, Krikorian wrote an article for National Review Online with a headline that may have inspired Gaffney: "It's Time for a Grown-Up Alternative to Trump's Crude Muslim-Immigration Proposal." So, what "grown-up alternative" alternative does Krikorian have to offer? A restoration of the Cold War-era principle of "ideological exclusion" so broadly defined it would likely result in Trump-esque ban on Muslims regardless. This is quite telling from a man who has, among other things, claimed refugees are "extinguishing" Europeans' national existence and that freedom of religion is "not a Muslim value." "Of course people could, and would, lie," Krikorian writes in his article, "but the very fact that such a question is asked would send a message about what we expect of people hoping to live among us." In his press briefing remarks, Krikorian reiterated many of the points laid out in his article. He continued to dismiss Trump's plan as unworkable while simultaneously advocating policy goals that are virtually identical. Such behavior should be expected from Krikorian. He previously praised the mass deportation plan Trump released during the summer because, in his words, "it does clearly advance the immigration debate." On his radio program in August, Frank Gaffney similarly approved, saying he was struck "by how basically sensible many of the things, if not all of the things" in the plan were. The Center for New Community, an organization that monitors and counters organized bigotry, has often noted that Gaffney and Krikorian are close colleagues. This isn't surprising, given their shared extremist and nativist agenda. What is troubling is the legitimacy their work is given by elected officials. Just last month, Krikorian testified before a congressional subcommittee on refugee policy. Rep. Lamar Smith (R-TX), the former chairman of the House Judiciary Committee, began his remarks by praising Krikorian. "First of all, I'd like to single out Mr. Krikorian and thank him for his excellent testimony. I honestly don't know how anyone could disagree with one word," Smith said. 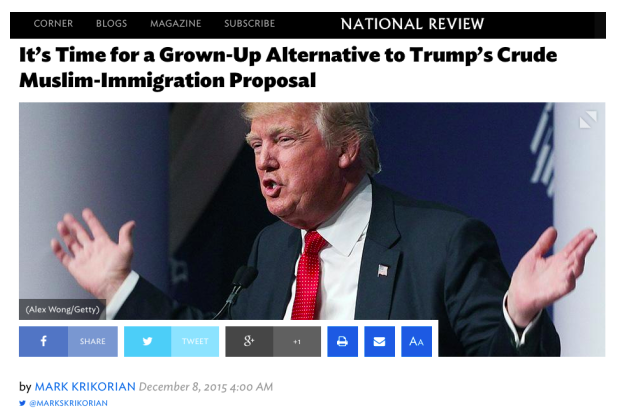 Krikorian, Gaffney, and many others within the organized nativist movement coordinate messaging through the far-right strategy group Groundswell, exposed by Mother Jones in 2013. To members of Groundswell and the nativist movement, Trump's campaign has been almost too good to be true. Trump's bigoted and outlandish comments being frequently reported and commented on raises the salience of their nativist policy and now they can appear to be the moderate, "grown-up" alternative to Trump's bombast. Krikorian and Gaffney, though, are anything but an alternative. "Grown-up" bigotry is still bigotry.